The entire electrical installation is controlled by this board which contains all the over current protection circuit breakers, Isolators and the earth leakage protection unit. When a ‘Socket outlet’ circuit breaker trips: The instinctive reaction is to switch the breaker back on, however this is not a good idea as the fault may still be present and could be aggravated, possibly causing a fire, here is a less risky approach. Determine the area affected and unplug all appliances that are plugged into that circuit. Generally if the appliance has developed a fault, some evidence of the electrical “burn out” is visible by a telltale black sooty deposit. Switch the circuit breaker back ON. If it trips immediately, then the problem lies in the wiring and it is best to leave the breaker OFF and call your Electrician. If the breaker stays ON and no visible signs of a fault can be seen, then plug each appliance back into the circuit and switch it on, proceed with this until the circuit breaker trips again – that would then be the faulty appliance. However, some faults may have cleared themselves and the appliance works normally, in which case the breaker would not trip again, or the appliance is ‘open circuit’ and consequently does not work and also will not trip the breaker. When a ‘Lights’ circuit breaker trips: The same caution should be applied. 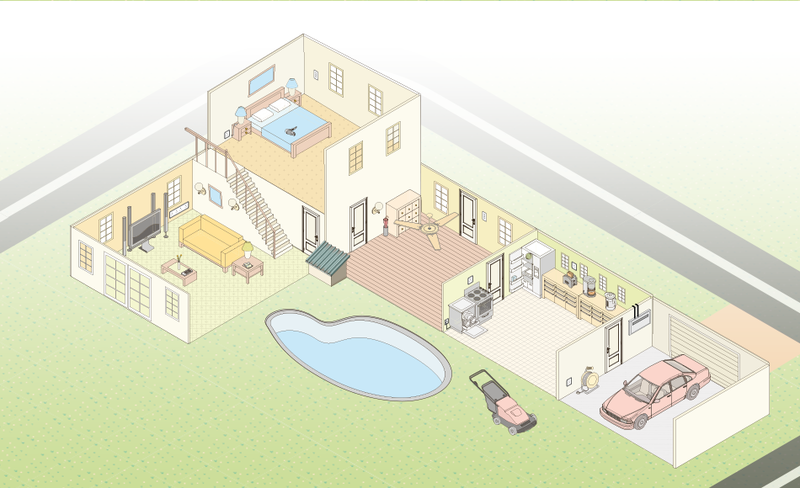 Determine the area affected and switch OFF all the light switches in that area. If the breaker stays ON, then switch each light switch back ON, proceed with this until the circuit breaker trips again – that would then be the light circuit. However, some faults may have cleared themselves and/or the globe has become open circuit, in which case the breaker would not trip again and the problem should be resolved by replacing the globe. Be mindful of any electronic devices such as ‘built in’ dimmers and timers which may have malfunctioned, in such a case, call your Electrician – do not attempt to repair or replace the wall switch assembly yourself. Switch the Stove and Oven (if separate) Isolator(s) OFF. Switch all the stove plates, oven elements and fans OFF. If the breaker stays ON, then switch each plate, element and fan, individually. Should any of this cause the breaker to trip, then that would be the faulty plate or element. You could leave it OFF and proceed to use the other plates or elements whilst waiting for the stove to be repaired. It is best to call your electrician or plumber, as it is not advisable to work on the geyser unless qualified to do so. Safety: Wires are conductors of electricity and are therefore dangerous when exposed and especially when the insulation has been damaged in any way. The electrical circuits are often not easily recognized by exposing wiring at any point along the conduit installation. Any changes may alter the polarity to the appliance or outlet and increase the risk of reduced electrical protection to the user. Certificate of Compliance (CoC):All electrical installations would have been issued with a detailed COC, by the contractor that carried out the work and tested it, in accordance with the ‘Wiring Code’. Consequently any changes to the installation, by anyone other than a qualified Electrician, will render the COC null and void. All socket outlets are rated at 16A and are protected by a 20A Circuit Breaker and also protected against earth leakage, by an Earth Leakage Unit. These two “sentries” generally protect you against electrocution and many causes of electrical fires in the house or office. Another safety feature that has been fitted to each socket outlet is the Safety Shutter. This prevents the insertion into the Live and Neutral socket entry holes, by the action of a plastic component, which in some cases, may be operated by the Earth pin of the plug. Check that the shutter works properly and does not expose any of the entry holes, other than the Earth one. Always switch the socket ‘OFF’ before plugging or unplugging an appliance into the socket outlet. Always check that the plug is not damaged in any way or the plug pins have dirt or any substance attached that could be transferred to the socket contacts, inside the socket outlet. When cleaning the socket outlet faceplate, use a soft soap on a slightly moist cloth; avoid water entering the socket outlet by way of the socket entry holes or the switch surround. Although these are essential items for any home or office environment, they are arguably the most risky to use. The main reason for this is that a long length of electrical cord is loose, on the ground and over various obstacles. The mains voltage is separated from the environment by 1mm of soft PVC insulation. This insulation can easily be, scuffed, shaved, punctured and sometimes cut by the most obvious events. The exposure of the inner conductors can cause injury, and electrical fires. From time to time, check the surface of the extension cord throughout its length; replace it if any exposed copper conductors are evident. Where the cord is used temporarily, ensure that it is not trodden on by arranging a “protective cover” over the portion exposed to traffic. Where a more ‘long term’ extension is required, ensure that the cord is fixed to the wall, out of the way of any traffic, by neatly spaced cable cleats of the correct size. Regularly check the state of the socket outlet and ensure that the shutters are operating correctly, check the plug pins for damage and adhesion of dirt and grime. Electrical cords near an open fire such as a braai area should be avoided and kept at a safe distance. 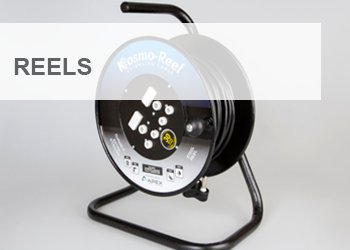 When using an extension reel, ensure that the cable is fully ‘un-reeled’ as to avoid the increased heating effect caused by the inductance of a coil carrying current. Caution is advised on the use of the correct rating, especially for cord extensions that are rated at 10A, check the appliance that needs to be plugged into the extension cord, especially heaters, which could require currents around the 8A level, a 10m extension cord would not be suitable in such a case and one would be advised to use a shorter version or one rated at 16A. Invariably there are many more appliances than socket outlets and the use of plug-in adaptors neatly solves this problem. Also, due to the different plug configurations that are not always found on the wall socket outlets, a multiple adaptor is essential. Part 1 : Conventional System, 16A 250V a.c. The most common plug and socket in use in South Africa originated from the old British System BS 546, with some small differences in pin lengths. It has been in use for the past 80 years, metricated in 1953 and revised in 1980. Britain replaced this standard with the “flat pin” fused plug BS1363 in 1947. Part 2 : IEC System, 16A 250V a.c. 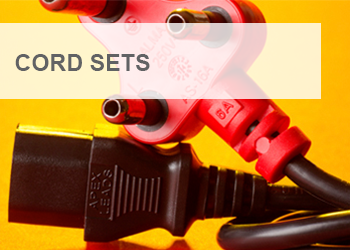 In the 1980’s SA decided to introduce the IEC worldwide plug and socket system, based on IEC 60906:1986, which had been under development by the international community from 1966. Arguably the SAFEST system in the world the socket outlet is mainly used in SA due to the fact the it accommodates cell phone chargers and 2 pin EUROPLUGS fitted to small power devices such as hair dryers etc. SANS 164-2 also caters for a 16A, 2-pin system that is extensively used in adaptors and is intended for Class II appliances and power tools. The standard allows the connection of an unearthed plug into an earthed socket but not vice versa – as this is a dangerous situation where an appliance that requires a protective earth, would be unearthed, which under fault conditions could cause fire or an electrocution. Part 3: Conventional System, 6A 250V a.c. 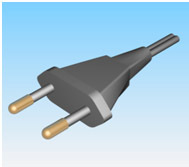 The 6A plug and socket has also been in use for the past 80 years, now used extensively for the connection of luminaries, in its non-rewireable form. The 6A, 2 pin version has been dropped several years ago together with the 2 pin “flat faced” socket which was commonly found on adaptors. As plug circuits are rated at 16A and protected by a 20A circuit breaker, this system fell out of favour for fixed installations. Part 4: Dedicated System, 6A 250V a.c. Dedicated systems are used for the connection of equipment such as computers to special power supplies that have uninterruptible or “clean power” characteristics, either from a special transformer or a battery/inverter system that takes over in the case of a power failure. 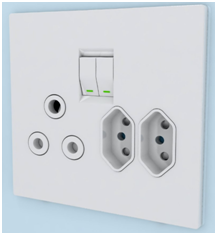 The main advantage of this system is that the dedicated plugs cannot be interchanged (within the dedicated configurations) but may be inserted into the standard (non-dedicated) system – SANS 164-1. Part 5 : Two-pole, non-rewireable plugs, 2,5A 250V a.c., with cord, for connection of class II equipment. 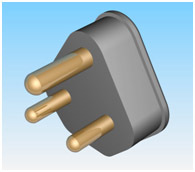 A 2,5A plug of the EUROPLUG design has smaller diameter contact pins than those in the 16A (SANS 164-2) version. And is extensively used in cell phone chargers. 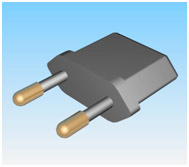 It is compatible with SANS 164-2 and SANS 164-6, both standards make provision for contact integrity between the two pin sizes. However because of the compatibility of plugs of a higher current rating, a 2,5A socket has not been allowed for obvious reasons. Part 6: Two-pole, systems, 16A 250V a.c., for connection of class II equipment. In accordance with the ‘Wiring Code of practice’ Each permanently connected (fixed) appliance must have a Switch Disconnector (isolator) within arm’s reach of the appliance, which disconnects both Live and Neutral supply to it. The Isolator is usually rated between 30A and 60A depending on the stove rating and in certain applications may be 3-phase. This is a safety measure and should be switched off whenever the stove or oven is being cleaned, or in the case where maintenance of any kind is undertaken. lways switch the isolator ‘OFF’ when cleaning the stove or oven. When cleaning the isolator faceplate, use a soft soap on a slightly moist cloth; avoid water entering the isolator through the isolator surround. Connection to Dishwashing and Laundry Machines: These handy appliances generally use high currents to operate, sometimes for short times, during their programmed cycles. Currents between 8 and 12A are quite common and although the wiring is perfectly adequate for this, one often is tempted to combine these machines on one plug by using a cord extension or a plug-in adaptor. Always use a cord set with a 16A rating. Avoid the use of plug-in adaptors, if absolutely necessary; use only a ‘double adaptor’ which is rated at 16A. Avoid, wherever possible, using two or more machines at the same time. The Pump and control-gear installation must be on or beyond zone 2 which is a minimum of 2m from the pool’s edge. The Control box must be of suitable IP protection rating. The Pump must be supplied via an Earth Leakage protection unit with a maximum tripping current of 30mA. The pool lighting is to be supplied via an isolating transformer with 12V maximum output to the light. It is most important to the safety of you and your family that NO 220V appliances are brought close to the pool, or used in its vicinity. Press the switches evenly and without undue force. Do not hit switches with force or hard objects. Remember that the plastic is your protection against contact with electrical current. Do not splash water or any liquid on the switch. To clean, use a damp cloth with a little soap and wipe off any residue with a dry cloth. Dimmers: Although most modern light dimmers are capable of dimming various light sources such as Compact Fluorescent tubes and LED’s, not all lamps are dimmable, so take care when purchasing lamps for replacement, that the product is marked as “DIMMABLE”. Some dimmers are not capable of dimming anything other than incandescent lamps – in this case the lamp may flicker, stay on one setting or not light up at all. This is especially the case with LED lamps; these generally require a special type of dimmer to enable suitable dimming. Dimming of fans or any other appliance: This is generally not possible and could lead to the dimmer failing. Fans are normally fitted with a 2 or 3 speed controller, which should be used without adding any other component (such as a dimmer). Where small appliances such as hair dryers, curling tongs and cell phone charging occurs, one usually finds the small two-pin “Europlug”. It is a good idea to have sockets of the SANS 164-2 configuration fitted in addition to the well-known SANS 164-1. 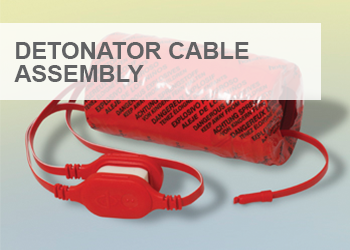 This is a better alternative to the use of adaptors and cord extension sets, often lying on the floor or carpet. It is also good practice not to have small appliances plugged in with the power ON whilst not in use; these should be packed away safely or switched off at the socket outlet. Common to most Lounges and TV rooms, where entertainment systems are in use, the common socket outlet is usually inadequate to supply the various devices. 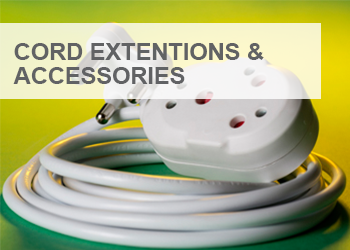 Cord extension sets with many sockets and different configurations are mostly used, these are untidy and often quite dangerous; the devices are usually switched on STANDBY and draw a continuous, although small, current. In the planning of a new house or installation, chose a ‘cluster’ type multiple socket-outlet which should be fitted behind the entertainment structure or alcove. Fit a simple ‘power monitor’ which monitors the main device (say TV set) and it that is off, then it switches off all the other devices. Avoid adaptors as far as possible. In the Main Switchboard – this protects the entire installation, referred to as a level II protection, is quite useful but still allows some surges to enter the installation. As close as possible to the equipment – this protects the equipment, referred as level III protection, it limits the voltage surge to a lower value and is found in several products such as plugs and cord extension sets. The surge protection device may reach the end of its useful life by having had dealt with several surges, in which case it will by internal design, be rendered inoperative – this is an important design feature since at the end of their useful life, surge arrestors of the metal oxide varistor (MOV) type, become dangerously hot to the extent that they can ignite. Monitor the warning light on the MOV protected product and replace it when this changes state as per the instruction legend. Ensure that the protection device complies with the SA standards (SANS 60884-2-5 or SANS 164-0 or SANS 1661, VC8008 or VC8029). Electro-mechanical: comprising of a bimetal thermostat that measures the air temperature, a graduated rotary setting to select the desired temperature and a relay to switch the power to the heating element under the floor. Electronic: which also has the relay but the temperature controller is a small microprocessor with a solid-state thermal measuring device. The temperature setting is done digitally and the display is usually a small screen or numerical display. It is generally not recommended to use the air temperature measurement method to control the under-floor heating but rather to make use of temperature sensors fitted into the floor close to the heating element. In this way the actual floor temperature is measured rather than the air above it. Cord Extension sets and Reels. Socket Outlet – Dishwashing and Laundry Machines. Socket Outlets for Lounge, TV Room and Study. PREPARE AND PREVENT. DON’T REPAIR AND REPENT. BE AWARE OF THE DANGERS OF ELECTRICITY. An electric shock is a negative physiological (trauma) or physical reaction (injury) that is caused by an electrical current that passes through a person’s body. This typically occurs when a person comes in direct contact with live wires of an electrical circuit, or with any conductive material such as metal that has become electrically charged. The severity of an electrical shock is subject to a number of different elements, such as the strength of the electrical current, how it passed through the victim’s body, for how long the victim was exposed to it and whether the victim’s skin was wet or dry. The reason for the latter is that water is a good conductor of electricity, or simply put, electricity flows through water much easier. The body will respond to the electric shock in direct proportion to the severity of it. A minor shock for example, might only cause a slightly uncomfortable tingling sensation. A moderate shock might cause burns and a major shock could make the heart stop all together. Apart from causing electric shocks, sparks from malfunctioning electrical equipment may set flammable or explosive materials on fire. In addition, there are also dangers attached to the sudden loss of power. For example, if a refrigerator suddenly stops working, it can discharge toxic or flammable gases and if magnetic or mechanical industrial equipment fail, some of the chemical reagents may be compromised. Every year, electrical malfunctions such as these mentioned above, cause a vast number of fires, substantial property damages, thousands of personal injuries and hundreds of deaths worldwide. The importance of electrical safety at home and in the workplace can therefore not be overemphasised. There are a number of precautions that can be taken to protect people against the dangers of electricity for as far as possible. This includes methods to insulate electric cables, guard the live electrical parts on a circuit and limit the current that can flow to the earth, as well as the usage of protection devices. Check all electrical equipment and wiring for faults before using it. Any damaged or worn out electrical cables should be replaced straight away. Make sure that all workers are aware of where the circuit breaker panels are and how to shut it down in the case of an emergency, such as an electric shock or a fire. Steer clear from using water or chemicals close to electrical equipment, for as far as possible. 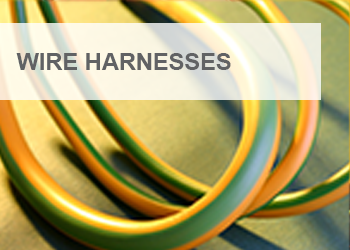 Adhere to the minimum safety health and safety standards for electricity in the workplace. For your convenience, these standards are outlined here below. We use electrical conductors such as copper wire to make it possible for an electric current to pass from the source of energy (where we switch iton) – to the point where we need to apply it. It is critical to make sure that the electricity does not leak anywhere and that there is no point where we can accidentally get in contact with it. The easiest way to accomplish this is through cable insulation. This simply means that we isolate these conductors with non-conductor materials (such as PVC or rubber sheathing) that prevent or reduce the leakage of electricity. There should be no copper conductors visible that a person could accidentally come in contact with anywhere in the cable. Without exception, electrical cords should be checked before use, especially when one considers that acerbic chemicals or cleaning solvents could erode insulation. There must be no point where a person could come into direct contact with the electrical wiring on the inside. Replace or repair damaged cords straight away, especially when it is used near wet areas. You need to be able to explain exactly what the cable will be used for, for the salesperson to make the correct recommendations in terms of type and size. 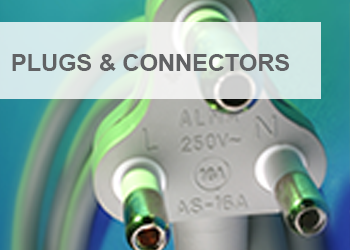 When it comes to electrical components, one should have an uncompromising approach to quality. So never settle for unknown brands or sub-standard materials, as an electrical malfunction can cost you dearly. Do look out for the following marks that are typically embossed or printed on the cable itself: manufacturer’s name; size of cable; amperage and wattage rating and SABS, VDE or other equivalent safety marks. Sockets or socket outlets are created to connect electrical equipment to the main source of power in a building. As soon as the electrical cord of the equipment is plugged into the socket and it is switched on, it enables the flow of electricity and provides the charge needed to power the equipment. Such an electrical socket typically has no less than two, but up to four openings or connectors that could be either male or female. To plug a cord into it, the number of connectors on the plug should correspond. 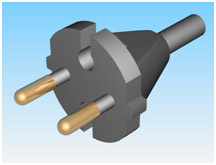 If the socket for example has two female connectors, the device should be plugged into it with a 2-point plug that has two male connectors. People often poke fingers or objects into a socket if they cannot get an electrical device to work. As a result, they touch live electricity and get shocked or hurt, which could be fatal, if there is a fault in the earth leakage. This can be prevented by mounting quality safety shutters or covers with a corresponding number of connectors over the sockets. In South Africa, this standard is compulsory and both socket outlets and portable socket outlets (adaptors) has to be fitted with shutter systems. Should the shutter system stop working or is jammed, you should render the product unsafe for use and have it replaced. Regardless of the electrical distribution system that is in place, there will always be some current that will leak out from the protective material and flow through to the ground. If this “earth leakage” is uncontrolled, it is extremely hazardous, as it can cause fires and even lead to fatal electrical injuries. To minimise incidents, an earth leakage protection device such as an earth leakage circuit breaker (ELCB) should be installed. An earth leakage circuit breaker is a safety device that will detect when the earth leakage exceeds the safe limit and automatically interrupt the electrical circuit to prevent an incident. Stay away from electrically charged circuits. Switch the power off at the main source before you start servicing or repairing any electrical equipment. In instances where electrical equipment must be plugged in for use, make sure that the hands are dry and that gloves and shoes are worn that does not conduct electricity. Avoid the use of electrical equipment under wet conditions such as in areas where water or chemicals are spilled, or in cold rooms or other areas where condensation is likely. If it cannot be avoided, be sure to keep the equipment away from the floor, by mounting it on a wall or vertical panel. Shut the power down at the circuit breaker or main source immediately if water or chemicals are spilled onto electrical equipment. Should any worker come in direct contact with live electricity in any way, never touch the equipment, the electric cord or the person. Use a leather belt that does not conduct electricity easily, to disconnect the power source from the circuit breaker or pull out the plug. Safety does not happen by accident. All electrical installations should adhere to the electrical safety standards as prescribed by the applicable laws and governing bodies in our country and all premises must have updated and valid certificates of electrical compliance. Do check that your electrical contractor complies with the relevant section of the Occupational Health and Health Act (OHS Act), the South African Bureau of Standards Code of Practice SANS 10142-1Code of Practice for The Wiring of Premises, as well as Eskom’s minimum requirements. IGNORANCE CAN KILL. KNOW THE DANGERS OF ELECTRICITY. The risks pertaining to electricity can generally be classified into two main categories. They are: direct and indirect. When a person accidentally touches live electricity directly, it will lead to a sudden discharge of electricity through the body, which is commonly known as an electrical shock. Subject to the voltage, such an electric shock can cause injury to the body in various degrees of severity. This includes falls, burns, irregular heartbeats, breathing that stops; bodily functions that shut down and finally electrocution or death. Sometimes leakage of electricity or uncontrolled electricity can cause damage to a building which then in turn could seriously harm or even kill the people who are in it. This includes the likes of explosions and fire. Considering the shocking statistics of fires, deaths and injuries caused by electricity across the globe, we cannot ignore the danger of it. Remember that the best risk is the one you didn’t take. Click here to see how safe is safe and what you can do to safeguard your environment from an electrical perspective. The first hour after a traumatic injury is referred to as the ‘golden hour’ as this is the period in which emergency treatment is most likely to be successful. Rendering first aid to a victim of electrical injury until full medical treatment is available, is therefore invaluable. It is recommended that the following is printed out and clearly displayed in all areas of the workplace where electricity is used and at home. National Emergency Management Service, paramedics or an ambulance immediately to get the injured person to an emergency room as soon as possible. This is best done by switching the power off straight away. Unplug the electrical appliance in question if it is undamaged or switch the power off at the fuse box or on the electrical distribution board. If it’s not possible to shut the power down, you have to physically pull the person away from the electric current. To do so, you have to stand on and use materials that are non-conductors of electricity. For example, stand on a book, wooden surface or newspaper and separate the person from the electricity with a rubber, wooden or plastic item such as a mat, chair or broom. If you feel a tingling sensation in your legs or lower body whilst trying to separate the person though, rather back off and call your local electricity supply company to switch off the power at the main source. If the incident took place in an industrial area where there are high voltage overhead power lines, you have to call the emergency number of your local electricity supply company and ask them to switch it off. Make sure that this number is handy for when it is needed. In many cases, an electric shock will cause the victim to stop breathing. Place two fingers on the injured person’s main artery or wrist to check for a pulse. If there is no pulse, start applying cardiopulmonary resuscitation (CPR) to help the person breathe at once. You could call emergency services and ask for an operator to guide you through CPR instructions telephonically. Apply chest compressions by using your hands to push down approximately two centimeters deep into the centre of the victim’s chest. Pump down 30 times at a rapid rate of more than once per second. If the victim still does not respond, tilt the head back, lift the chin, pinch the nose and cover the mouth with yours. Then start blowing oxygen into the mouth until the chest starts rising. Blow in for one second at a time and repeat twice. Keep on alternating these pump and blow actions until the victim starts breathing or medical help arrives. If there is more than one person on the scene, one can pump while the other blows. The spread of any infection during CPR is extremely rare and evidence shows that you cannot get HIV/AIDS from performing it. The main risk to take note of is the fact that many victims start to vomit during CPR. If this happens, just turn the person’s head to the side and try to wipe away the vomit to avoid suffocation. 4. ATTEND TO OTHER INJURIES. Once the person breathes, you have to check whether there are other injuries that require immediate attention. If the person is bleeding, use a clean cloth or cloth-like material to apply direct pressure on the wound until the bleeding stops. If the wound is on an arm or a leg, elevate it. You can usually tell that there is a fracture when the slightest movement causes the victim pain, when a limb or joint appears deformed or if there is a bone piercing through the skin. Do not move the victim if this is the case. Simply provide comfort and stay with the victim until medical help arrives. The following is an outline of first aid that can be performed on victims of burns. Minor burns could be 1st or 2nd degree burns. A 1st degree burn applies when only the outer layer of the skin is burnt. The skin is usually red and swollen and it might be painful. A 2nd degree burn applies when the outer and second layer (dermis) of the skin is burnt. In this instance, blisters would typically develop, the skin will be swollen, red and blotchy and it will be painful. If the burnt area is larger than 3 inches or 7.6 centimetres in diameter, or of they are on the hands, feet, face, groin, buttocks or a major joint, it should be handled as a major burn (see major burns advice below) and should best be treated by a medical professional. Hold the burnt area under cool (not ice cold) running water for about 10 – 15 minutes until the pain disappears. If this is not possible, immerse it in a container with cool water or place cold compresses on it. This will reduce swelling. Wrap a sterile gauze bandage around the burnt area to cover it without applying too much pressure. This will protect the burn from infection, protect the blistered skin from further damage and reduce pain. Give the burn victim over the counter pain relievers according to the dosage prescription on its container. Apart from alleviating pain, this will make the person more comfortable and relaxed. NEVER put ice on it, as it can do more damage to the wound. NEVER use fluffy cotton or any material with lint in it to cover the wound, as this can cause infections. NEVER apply greasy or other household substances on it such as butter, ointments or egg whites, as it can also cause infections. NEVER break burn blisters open as this makes them even more prone to infection. Major burns affect all the layers of the skin, cause permanent damage to the tissue and may also injure muscle and bone. It could appear charred black or dry and white. Apart from the burns, the victim may also experience difficulty breathing and may suffer from carbon monoxide poisoning or other toxic effects due to the excessive inhalation of smoke. DON’T… remove the clothes. But DO make sure that the victim is no longer in contact with any smoldering materials. DON’T… immerse the burns in cold water. It can let the victim’s body temperature and blood pressure drop and let him or her go into shock. DO… make sure that the victim is breathing. If not, start applying CPR as outlined above. DO… raise the burnt body parts above the heart level if you can. DO… cover the burnt area with cool, moist bandages, cloths or towels. Check that the victim has been taken to a proper emergency room, hospital, clinic or medical centre for professional medical assistance. The victim should be thoroughly examined and a series of medical tests may have to be performed as well.